Inaugural Parade 2017 in Washington, D.C. The Presidential Inauguration Parade is an American tradition honoring the newly sworn in President and Vice President and parading through the streets of Downtown Washington, D.C. The event is held every four years and includes a procession of ceremonial military regiments, citizens' groups, marching bands, and floats. The inauguration parade is open to the public and is televised so that millions of Americans can view this special event. See photos of all of the 2017 inaugural events. The presidential inaugural parade is coordinated by the Joint Task Force-National Capital Region. Since 1789, the U.S. Armed Forces has provided support for official presidential inaugural ceremonies. 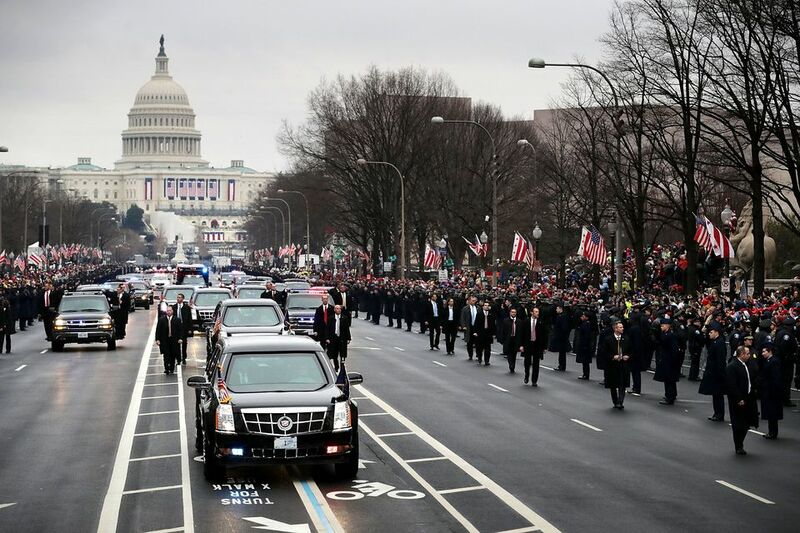 The earliest inaugural parades served as military escorts for incoming Presidents to the swearing in ceremony and grew to include floats and thousands of participants. Representatives from all 50 states follow the President and Vice President from the Capitol down the 1.5 mile route on Pennsylvania Avenue. More than 8,000 parade participants represented forty organizations including high school and university marching bands, equestrian corps, first responders, and veterans groups. Those selected to join the inaugural parade are listed below.